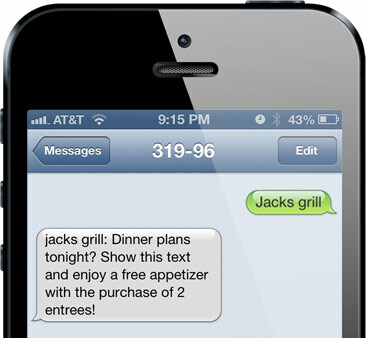 Text message marketing is the way to market your company. Whether you’re a restaurant or a school, a hair salon or a professional sports team, text marketing reaches more people in real time –and just when you want to reach them. The SMS marketing techniques have certainly came in and changed the way that you market, and you can take confidence in knowing the results are proven –not simply a bunch of talk! SMS marketing rates are better than any other form of marketing, including social media and email marketing. These stats make it easy to understand why text marketing us so beneficial, but what isn’t easy Is putting your marketing plan together. Where do you start? How do you word your message? What kind of offers should you include? All of these things are very important in success and we are sharing 5 text marketing campaign examples to get you started. It is important that you take a look at these text marketing campaigns and take from them all of the creativity and inspiration possible. It is then that you will be able to create your own strategic, inspiring text marketing campaigns. Who wouldn’t want to text a special code for a change to win a shopping spree at your store or another awesome prize? Not only will text marketing contests create plenty of fun times and excitement, it also engages the consumer and greatly increases the number of subscriber that you have. While it isn’t realistic to offer a contest every day or every week make sure that this is a component of your campaign. A freebie is attractive to people of all ages. Give them a freebie, they’ll come into your establishment and are very likely to spend more. You win and so do they. There are a tons of freebies that you can offer to those who opt-in for your list. Make sure that you offer a freebie for signing up, perhaps one for the birthday and any other well-deserved occasions that you feel appropriate. Your subscribers will love you for a long time to come. Considering targeting your mobile marketing campaign for those on the ‘VIP list.” This list of important individuals will receive n array of benefits and perks to make them proud to be on this extravagant list. From sales only for those who have opted-in, to first notification of sales and clearances, this is the list that you really want to be on when business success is your desire. Whether Christmas, birthdays, anniversaries, Hanukah, New Year’s or other special days of the year, sending out special well wishes and greetings on these most important days can put a smile on the face of the recipient and keep them loyal to your brand. Be sure that you include something extra-special on these occasions to spice the event up even more. A quick couple question survey is perfect for SMS marketing, or you can send a link to a larger survey. It is easy to answer and provides you with valuable information that will do nothing but greatly benefit you. These survey’s ensure that you give customers just what they are expecting and so much more and are highly beneficial to businesses of all sizes. These are just 5 of the numerous ways in which you can use SMS marketing to benefit your businesses success. These text marketing campaign examples should get you on the right path, so make sure that you do not miss out on thee numerous benefits for yourself.